Sean Penn’s handful of small-screen credits have been inconsequential at best, save for perhaps a two-episode guest actor stint on Friends back in 2001. But now here he comes in a big way, first as the head astronaut in Hulu’s The First series (launching on Friday, Sept. 14) and next year in the lead role of Andrew Jackson for HBO’s American Lion miniseries. 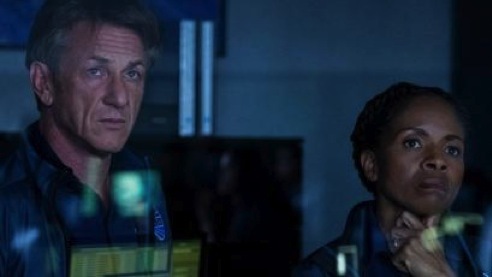 The two-time Oscar-winner (Mystic River, Milk) isn’t half-stepping in the eight-episode Season One saga of a “near future” (specifically 2031-33) endeavor to put the first humans on Mars. After recently turning 58, he’s notably buffed for the role of shakily resolute Captain Tom Hagerty. On the day of what turns out to be a launch gone very wrong, Penn’s Hagerty is first seen jogging bare-chested through his neighborhood. The First seems mighty proud of his pecs, with recurrent shots throughout of Hagerty either on the run or navigating the bottom of a training pool with arm weights that further tone his already ripped physique. Clearly, Penn came to play, both physically and emotionally. From departure to return home, the mission is supposed to last two-and-a-half years. And despite a thoroughly involving Episode 1, The First sometimes seems to take that long gearing up after an initial disaster stuns everyone involved. In short, there’s too much wasted space and not enough outer space. But the soapier elements and flashbacks to the Hagertys’ past also have some pulling power, particularly in Episode 5. Hulu made the entire series available for review. Hagerty is a widower whose self-destructive and artistic wife, Diane (Melissa George), still gnaws at his psyche while his young adult daughter, Denise (Anna Jacoby-Heron), repeatedly goes off the rails. Penn and Jacoby-Heron have some affecting scenes together. It’s an impressive first big splash for her and a chance for Penn to fully convey his anguish while still clinging to his first love, which is outer space. Another major player is Laz Ingram (Natascha McElhone), founder and CEO of what’s supposed to be the forward-thinking Vista. Undaunted by a major setback, she continues to push hard for another mission to Mars in the interests of giving a growingly dilapidated Earth a futuristic safe harbor if the fabled Red Planet indeed can be colonized. But the President and some senators are balking at another mega-expenditure. At the start of Episode 2, the next launch window is 23 months away. Each succeeding hour shortens the time frame, but it’s still a long way to go if you’re an itchy viewer wondering if the big blastoff indeed will ever happen. Let’s just say that Episode 8 finally rewards one’s patience, and that Hulu for now is planning on a Season 2 rather than leaving everything up in the air. Hagerty, who’s brought back into the fold after the Mars mission’s darkest hour, heads a team of four other astronauts. Principal among them is veteran flyer Kayla Price (LisaGay Hamilton), an Army colonel who greatly respects Hagerty but also is getting a little chapped about again being the sidekick. In her personal life she has a supportive female partner who’s built most of the house in which they live. The First takes some wholly predictable turns, and also a number of sometimes extraneous side trips, during its long buildup to the ultimate crunch time. Episodes 3 and 4 dawdle the most before things start to get back on track in large part. Production values are stellar throughout, with Hulu spending a reported $50-plus million on The First. Hulu and its two major streaming competitors, Netflix and Amazon Prime, seem to have money to burn these days. Perhaps even enough to fund their own space programs. The performances also are uniformly impressive. Penn brings his star power and flexes it while McElhone has a standout scene in Episode 1 and then keeps delivering throughout. Jacoby-Heron strongly portrays a character who’s both heartbreaking and infuriating; Hamilton resonates as a selfless team member who increasingly wonders if she’s given too much of herself to the ironclad chain of command. Still, The First could be made of stronger stuff than it is. Its use of imagery and a drawling, unidentified voice-over philosophizer (who sounds a lot like Matthew McConaughey) are both recurrent and generally intrusive. The theme music can be a bit of a grind as well. And some of the personal stories lapse into melodrama, even though the core Hagerty triangle for the most part is not guilty of this. A Season Two, assuming there is one, has the potential to be appreciably more eventful. For now, you’re advised to ride out The First, sluggishness and all. There are enough bright spots to bring it all home, with Mars very gradually getting closer to becoming more than just a talking point.